When you have been in business for over 85 years, you learn a thing or two about how to treat your customers right. At Napleton Mazda of Libertyville, you have been and will always be our first priority, which is why our incredible service is tailored to suit your every need. We are the name you can trust to consistently put you first and guide you through the process of buying, leasing or repairing your beloved Mazda. Our highly trained staff truly cares about you and your vehicle, both during your time at our dealership and long after you've driven off of our parking lot. The proof is in our Napleton Value Advantage Program that protects your car against potential dings, dents, lost keys, windshield cracks, tire damage and more! 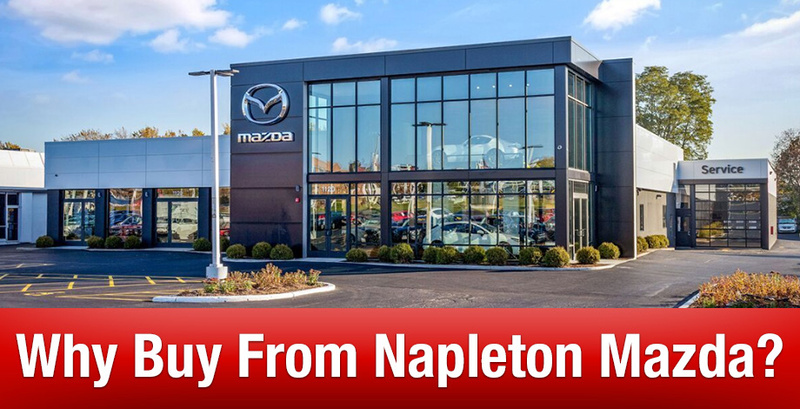 The Napleton Auto Group has three outstanding stores in Libertyville, so you know you'll find an expansive inventory with your future new or pre-owned Mazda sitting there awaiting your arrival on our lot. Plus, when you enter our Mazda dealership in Libertyville, IL, you can't help but notice our brand-new, state-of-the-art Ford sister dealership building right next door. This facility truly reflects how hard we work to deliver a memorable, enjoyable experience every time you decide to pay us a visit. Looking for More Reasons Why You Should Buy From Napleton Mazda of Libertyville? -We are excited to announce that we have built a brand-new facility for our Mazda dealership to help ensure you have a quality visit every time you stop by to visit us. -When you service your vehicle with us, you can take advantage of complimentary coffee, bottled water and Wi-Fi to keep you content and entertained while you wait, as well as a free shuttle service so you can carry on with your day. -We have an impressive inventory of used cars! In fact, we have 800 to choose from. -In regards to used cars, we offer a 3,000-mile or 3-month powertrain warranty for any used car with under 100,000 miles on it. -We are heavily involved in our Libertyville community that has supported us for the past 85 years, and we continue to give back in appreciation whenever we can.